Okay, it’s what, Tuesday? And Julia is freaking out about a ghost. Yeah, right on schedule. Sorry to drop you into the middle of things like this, but this is how we roll in the six-nine. This is what television does now. Julia’s in another dusty storage room in Collinwood’s extensive dusty storage room district, looking for clues. She’s not really sure what kind of clues she’s looking for; she’s just kind of browsing. You see, the children have been kind of weird lately, and there was this silversmith who died in the drawing room — well, actually, it started with the antique telephone, and Mr. Jughans, and then the strychnine, and when they dug on the spot where the ghost was pointing, they found a little coffin with a dead kid inside, so they took the pentagram necklace from around the kid’s neck, and the grandfather clock fell over. It’s been a whole thing. Just try to follow along. That’s kind of all you can do right now, because this is the point where the show gets noticeably faster. The writing staff dumped the slowest guy on the team last week, and all of a sudden everybody is in a desperate hurry. The last time they put their foot on the gas like this, it was the summer of 1968, but the show didn’t really get faster then; it just got weirder. They piled one strange thing on top of another, and just kind of stacked it up as high as they could until it fell over. There were two vampires, plus a Frankenstein and a lady Frankenstein, and a guy who was basically the Devil, and one of the vampires was a witch, and people traveled through time, and everyone was talking at once, all jockeying for airtime. But they’re not going to make that mistake again, not when there’s a chance to make some new mistakes. There’s a lot of different elements in the current storyline, and they don’t really fit together in any kind of coherent way, but at least they don’t argue with each other all the time. Last summer, every bonkers story idea needed to be a whole character, and they each hated all the others. Now the story elements are mostly props, like the gramophone, or the dead silversmith, or the photo that Julia’s about to unearth in an old family album. 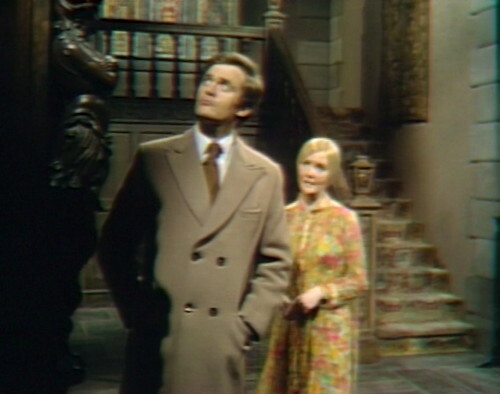 Today’s featured object is an extremely unlikely photograph of a tall young woman, standing in the Collinwood foyer and looking at nothing in particular. This is one of the ghosts currently infesting the house and leading everybody in circles. It’s been established that this woman was a servant in the 1890s, so I don’t know why somebody took a picture of her and stuck it in a photo album. Maybe they were having a scavenger hunt or something. Now, once you’ve found an old photograph, there’s not that much you can do with it except look at it, and that doesn’t make for gripping television. I mean, 1960s soap operas tend to be kind of sedate, but there’s a general expectation that the pictures need to move, at least. That’s pretty much baseline. So the door slams shut on Julia, and then we get the usual bag of haunted house tricks — the window blows open and the curtains billow, the chandelier starts swaying around, and the candle blows out. Julia gets kind of overwrought about it, crying and pounding on the door, although this is honestly not the scariest thing she’s seen lately. A few weeks ago, she watched a vampire smack a rampaging werewolf in the face with his cane. This is nothing. She’s just being high-strung. So Barnabas comes in, and the haunted house routine comes to an abrupt end — but when Julia tries to show him the photograph, it’s mysteriously vanished from the album. They stand around and talk about it for exactly one minute and six seconds, and then we’re done with that, and we’re off to look at something else. I’m telling you, we do not have time to dawdle these days. So it’s off to the next sequence on today’s program: the young bachelor werewolf at home. Chris is returning from a pleasant date with Carolyn, humming and smiling — and all of a sudden, he’s doubled over with pain. 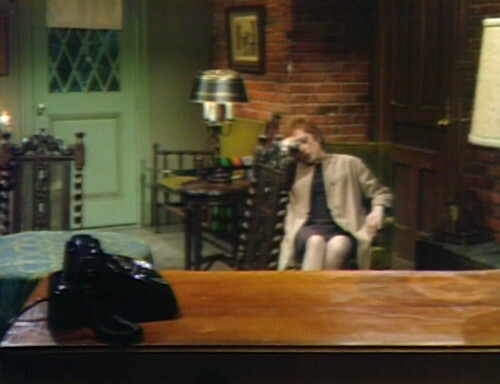 Chris makes a frantic call to Barnabas and Julia, and they rush over to the cottage to help. This is the agony that Chris always feels just before he turns into a werewolf, but there isn’t a full moon, and he shouldn’t be changing. I guess everybody’s in a hurry today. Barnabas: How much time do we have before the change begins? Barnabas: That’ll give us enough time to get you to the mausoleum. Chris: No, we can’t do that — the pain, I just can’t get there in time! 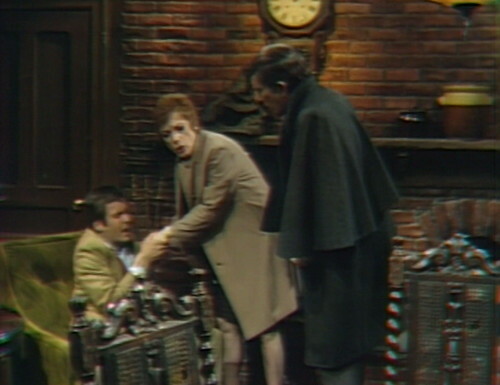 But Barnabas gets Chris on his feet and bundles him into the car, then drives off to the mausoleum, where they can keep the werewolf locked up all night. Julia stays behind, so that she can stand near the clock and look worried. It’s 1:10 am, if anyone’s wondering. 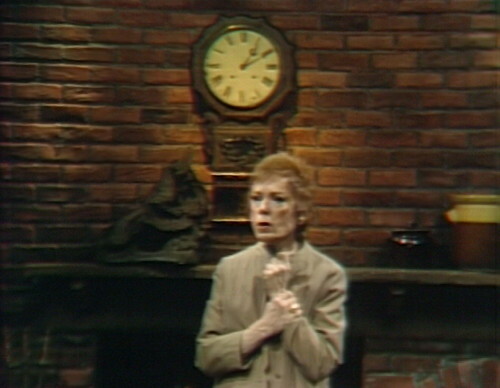 Then the scene fades to a shot of the clock in the Collinwood foyer, because we are super obsessed with what time it is today. And then somebody knocks on the door, and we get a look at his wristwatch. That’s what Dark Shadows is these days, just an endless series of timepieces. Carolyn answers the door — and standing on the mat, big as life, is Jeff Clark — Vicki’s husband, who married her and then traveled back to the 18th century with her, apparently forever. The last time we saw him was four weeks and a hundred and seventy years ago, heading off into the sunset with a new bride and a rap sheet. Now he’s standing on the porch at 1:10 in the morning. Isn’t life funny? But as it turns out, the guy who strolls into the house uninvited and refuses to answer simple questions isn’t Jeff Clark after all. He’s a brand-new character named Ned Stuart, who’s decided to show up at Collinwood to look for his old friend, Chris. So let’s just consult the resume for a second. When Roger Davis came on the show, it was during the 1795 storyline, and he played a young lawyer named Peter Bradford. When Vicki returned to the 1960s, she met a young amnesiac named Jeff Clark, who was actually Peter. Vicki and Jeff/Peter just left the show a month ago, and now Roger Davis is back, and calling himself Ned Stuart. That means Roger is now the king of identical characters who show up for no reason with different names. They all wear the same clothes, and they have the same mannerisms, and they’re all obnoxious. This feels like recasting, but it’s not — it’s actually the opposite of recasting, whatever that would be. Déjà casting? Of course, they’ve had actors playing multiple characters before; that’s how they did a four-month flashback to the 18th century, using the same cast. They’ve also used the classic soap opera trick of bringing a popular actor back to the show after his character’s death by giving him a previously unmentioned identical twin. But this is something new, one of those quiet Dark Shadows milestones that you don’t necessarily notice as it’s happening. This is the first truly casual déjà casting. Ned isn’t another incarnation of Peter/Jeff, he’s not a twin brother, and he’s not part of a new timeline. He’s just a different character, played by the same guy. A character leaves the show, you wait a month, and then the actor shows up as somebody else. So that’s how things are, in this fast-paced futuristic world of Nineteen Hundred and Sixty-Nine. Clues appear and disappear before our eyes, the werewolf can’t wait for a full moon, and people show up at Collinwood in the middle of the night and claim to be different people. No wonder everyone keeps checking what time it is. What time isn’t it? 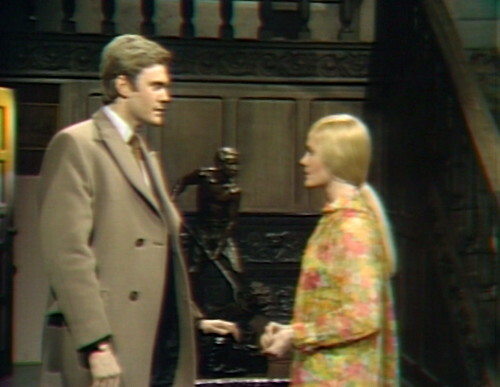 In act 1, Julia tells Barnabas, “Someone wanted me to leave this room!” The ghost actually locked her in the room. At the beginning of act 2, Barnabas asks, “Julia, are you absolutely convinced that the woman we s-s-saw in the photograph was the woman we saw the other evening?” He stumbles on the word “saw”, because he realizes that the line should be “the woman you saw in the photograph”. I don’t think Roger Davis is the first DS cast member to meet the criteria described here for Déjà casting, Vince O’Brien played lawman Dan Riley and then was recast as one of the Sheriffs Patterson. What about Thayer David? First playing Matthew Morgan and later recast as the Stokes family? It does seem odd that there would be a picture of a maid by herself. 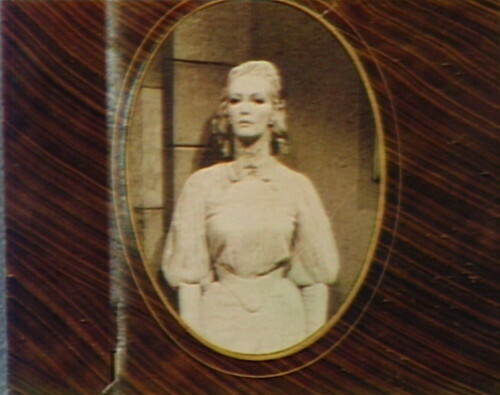 I imagine if Dark Shadows got the “Star Wars” treatment, they’d photoshop (old) Edith in to the picture. And we never really get a satisfying explanation for why Chris werewolfs on cue. Has it been confirmed yet that Beth was a maid? Based on dialogue and her clothing, it still seems like the intent is for Beth to have been the Collins governess of the period. When we return to 1897, Beth’s hair and clothing have changed significantly, and future flashbacks reflect the alteration. Agreed, at this point Beth is still supposed to be of a higher station than just house maid. I like it when a new set shows up, like that storage room. It doesn’t look like a re- dress of any other room we’ve seen before. 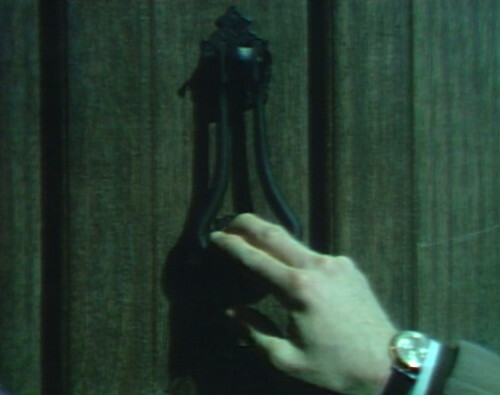 It breaks the monotony of the Collinwood foyer Or the Old House drawing room. NO!!!! Roger Davis is back in his ‘gropiest’ role yet. Like a bad penny, he’s turned up again. I like that Barnabas refuses to have electric lights in the Old House, but he learned how to drive. I wonder who taught him? Julia? Oh, he’ll drive, alright, as long as it’s not an electric car. For Barnabas, a car must be powered by candlelight. Or with his feet. Maybe it’s a Flintstones car. Through the courtesy of Frid’s two feet. When you’re with the Fridstones. I suppose Barnabas considers driving a car different from preserving the “authencity” of the Old House. However, what’s interesting to me is that the “man out of time” aspect of Barnabas’s character vanished sometime in the middle of 1968. He doesn’t long for the past like he did in 1967 — yet another way he is almost the Earth 1 Barnabas. Barnabas’s backstory involved co-opting random bits of established history lying around when he arrived: Josette as the lost love and the Old House. 1991 DS approached those elements as gospel even if they don’t make as much sense outside the context of the series and are almost time wasters (Barnabas restoring the Old House, which in 1991 means little because, unlike the original series, the audience hasn’t spent a year or so thinking of the place as the creepy haunted house on the property). 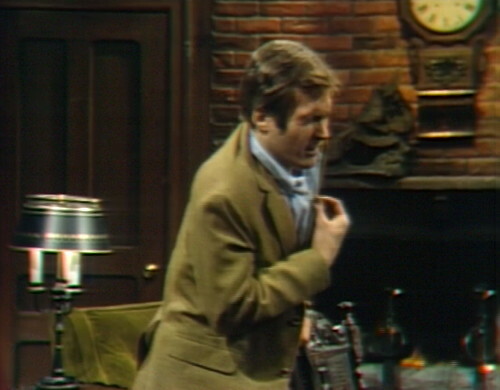 Now, the current kindly butler Uncle Barnabas might as well live at Collinwood. And he doesn’t have a coffin or even a murder lab to hide in the basement. 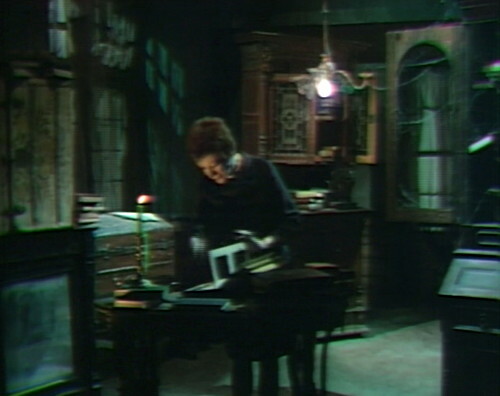 A Barnabas with secrets is a more interesting Barnabas, which is what makes the Old House a great home base for him, but this Barnabas wouldn’t care that much if the place had electricity. It’s true, it no longer serves any purpose for Barnabas to draw the line before Edison. No more Victoria to share that obsession with. I’d like to see the birth date on his driver’s license. Also, for eye color it’s probably listed as BLD (for bloodshot). Well… If you are Ben…..
They’re a modern sixties family…..
Let’s ride, with the Collins down the street. Couldn’t they have died his hair, given him a beard…done something so he, at least, doesn’t look exactly like Jeff Clark/Peter Bradford. Whether he’s Jeff Clark, Peter Bradford, or Ned Flanders – he’s still horrible. I agree… I hate his voice so much. It is a toss up as to which character makes me want to scream SHUT UP at, Amy or this Ned/Peter/Jeff conglomeration. It’s 1:10 am the entire episode. 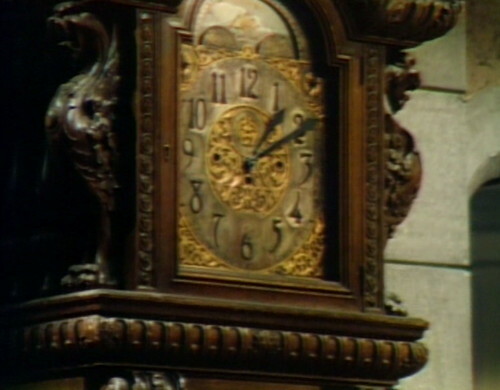 Chris’s cottage clock never changes, and when we see the Collinwood foyer grandfather clock at 1:10, Ned Stuart arrives at the door shortly before he goes to the cottage, where it’s still apparently 1:10 am even after Chris has come home from his date, started to transform, called Barnabas, and Barnabas and Julia have come to the cottage, Barnabas has taken Chris to the mausoleum, seen Chris transform there (he says), and returned to the cottage. They ARE in a hurry today–so much so that they are able to do about an hour’s worth of activities with no time passing. Have they entered the Speed Force or something? It is truly sad that poor Ned had the same annoying voice as Jeff and Peter… now I wonder if he is going to be grabbing all the females in his scenes? 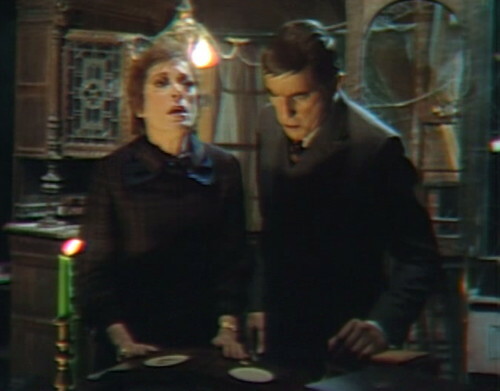 Looking only at the first couple of acts in this episode, it ranks among my favorite because of how adorably united Julia and Barnabas are, from their gentle manipulation of Liz to their race to help Chris. 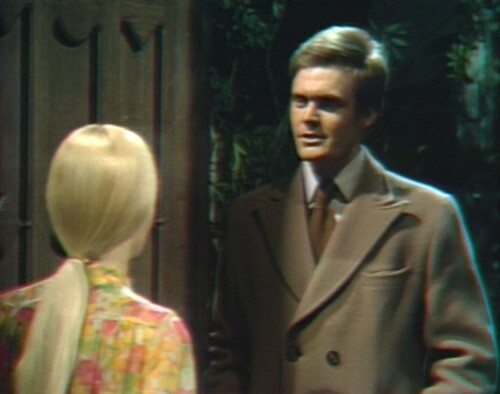 (Special 💘 pangs when Chris called asking Barnabas–and only Barnabas–to come to the cottage and, without first consulting Julia, Barnabas replies, “We’ll be right there.” Yes. They are so totally and perfectly a “we” now). But yeah…the last act in the show, with Roger Davis announcing himself in his most obnoxious role yet (and incestuous at that)…dammit. From such a happy high to such a nauseated low. One thing that has caught my attention as I engage with DS “fandom” after a half-century away from this show, is the seemingly united dislike of certain actors or characters. These DS conventions that you speak of, does he appear at them, I wonder, and do the fans reward him with a kick on the shins? It just seems 2018 DS fandom is united in a hatred of Davis and all his incarnations; I’m still not sure I understand that fully, though I did start to tire of the way he always grabbed Alexandra’s head every time they had a scene together. Maybe I’m seeing him a bit more through the “haters” eyes, I don’t know. And I even watched “Alias Smith and Jones” because he turned up there. For a few years in the ‘seventies, I tried to keep up with DS-players post-1971 careers.